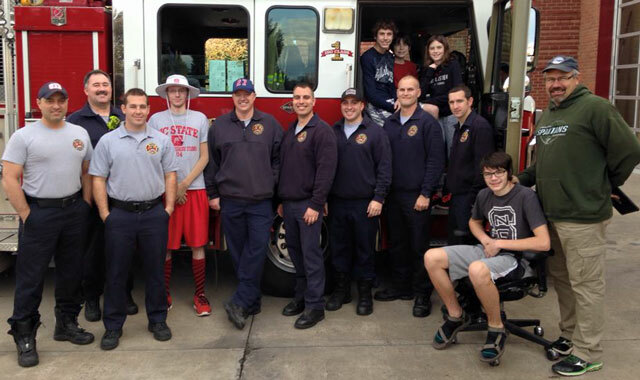 The NC Fire Fighters' Burned Children Fund annually provides grant funds for NC Fire Departments to create and enhance current fire and life safety education programs in their community. Grant applications are reviewed by a FFBCF committee and awarded based on creativity and need. Awards are presented at the NC Fire & Life Safety Conference. Matthews Fire-Rescue Department - $750.00 - Citizens Fire Academy. Chapel Hill FD - $1000.00 - " Big Blue's Book of Safety Fun"
Thomasville Fire Department - “Taking A Walk in My Boots” – Helping Family Members Understand the Job of a Firefighter Program, to increase family and public awareness of a firefighter’s duties. Asheville Fire & Rescue - “Fire Safety For Seniors,” a Remember When follow-up program for foster grandparents and/or senior companions. Charlotte Fire Department - Juvenile “Matches and Lighters are Tools Not Toys,” a Blaze mascot education program. Boger City Fire Department - “Sparky” costume supplies and educational materials. South Fork Volunteer FD - a “Fire Safety” Program to establish a fire & life safety in the VFD, to increase fire safety awareness. Gaston County Fire Marshal’s Office - “Fire Truck Kiosk” Program to educate Gaston County library users on fire and life safety. South Mills Volunteer FD - a “Neighborhood Safety Festival” directed toward military families. Erwin Fire & Rescue Squad - “Stove Top Fire Stop” Program to reduce cooking fires in residential program.